This 100% polyester somewhat sheer blouse is by Team Plus. 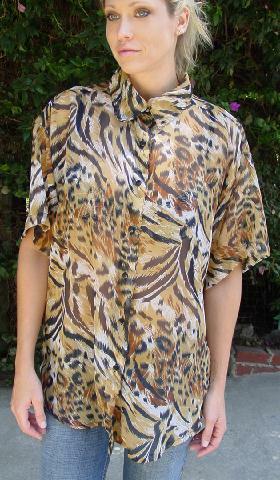 It has short sleeves, a shirt collar, and seven black buttons down the front. 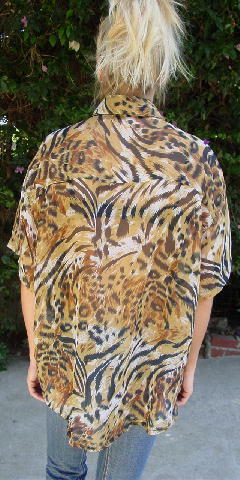 It has a design pattern of various animal prints in black, white, and browns. The center bottom is 4 3/8" longer than the side seams. It's from a larger size model who only wore it once. shoulder to end of sleeve 8 1/2"
shoulder to bottom side seam hem 23 1/2"
side to side bottom hem 26"